Not to be confused with Cholón District. Chợ Lớn ( listen, Chinese:堤岸), usually Anglicized as "Cholon" in English sources, is a quarter of Ho Chi Minh City, Vietnam. It lies on the west bank of the Saigon River, having Bình Tây Market as its central market. Chợ Lớn consists of the western half of District 5 as well as several adjoining neighborhoods in District 6 and District 11. The quarter has long been inhabited by Chinese people, and is considered the largest Chinatown in the world by area. The Vietnamese name Chợ Lớn literally means "big" (lớn) "market" (chợ). The Chinese name (and original name) is 堤岸 (pronounced Tai-Ngon in Cantonese and Dī'àn in Mandarin, which means "embankment" (French: quais). The Vietnamese reading of the Chinese name is Đê Ngạn, but this is rarely used. Vietnamese speakers exclusively use the name Chợ Lớn, while Chinese speakers (both inside Vietnam and in China) are the only users of the original Chinese name. Typical shophouse architecture of Cho Lon. 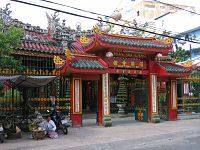 The city of Chợ Lớn was established by the Hoa community. The Lê dynasty which was the ruling family in the sixteenth century began to decline in power and two rival families, the Trinh and Nguyen families began to vie for power to fill in the void of the Lê. Nguyen was then appointed as Viceroy of the South with headquarters at Huế where they encouraged Chinese immigration to settle down into the area. In 1778, Hòa living in Biên Hòa had to take refuge in what is now Chợ Lớn because they were retaliated against by the Tây Sơn forces for their support of the Nguyễn lords. In 1782, more than 10,000 Hòa were again massacred by the Tây Sơn and had to rebuild. They built high embankments against the flows of the river, and called their new settlement Tai-Ngon (meaning "embankment" in Cantonese). Chợ Lớn was incorporated as a city in 1879, 11 km from Saigon. By the 1930s, it had expanded to the city limit of Saigon. On 27 April 1931, Chợ Lớn and the neighbouring city Saïgon were merged to form a single city called ‘Saigon–Cholon’. The official name, however, never entered everyday vernacular and the city continued to be referred to as ‘Saigon’. ‘Chợ Lớn’ was dropped from the city's official name in 1956, after Vietnam gained independence from France in 1955. During the Vietnam War, soldiers and deserters from the United States Army maintained a thriving black market at Chợ Lớn, trading in various American and especially U.S Army-issue items. This was the area, near the Quan Âm Pagoda where photojournalist Eddie Adams took his famous execution photograph. Four Australian journalists were also killed in Chợ Lớn during the Tet Offensive in 1968. Today, Chợ Lớn attracts many tourists, especially mainland Chinese and Taiwanese. Yvon Petra - He was born in Chợ Lớn. He is best remembered as the last Frenchman to win the Wimbledon championships men's singles title in 1946. Cao Văn Viên - Chief of the Joint General Staff of the Army of the Republic of Vietnam from 1966 to 1975. Gontran de Poncins - French author, aristocrat and adventurer lived here in 1955. He resided in the Sun Wah hotel, keeping an illustrated journal which was published as From a Chinese City (published in 1957). "He chose Cholon, the Chinese riverbank community snuggled up to Saigon, because he suspected the ancient customs of a national culture endure longer in remote colonies than in the motherland. In effect, he was studying a bit of ancient China." Wikimedia Commons has media related to Chinatown, Ho Chi Minh City. "Cholon" . Encyclopædia Britannica. 6 (11th ed.). 1911. p. 267. ^ Socio-Economic Background of the Hoa People (PDF) (Thesis). Shodhganga. p. 34. ^ Faber, John (1978). Great News Photos and the Stories Behind Them. Courier Dover Publications. p. 136. ^ Colebatch, Hal G.P (30 October 2009). "The Saigon media slaughter". The Australian. Retrieved 2013-11-06. ^ St. George, Donna. "Cao Van Vien, 1921-2008." Washington Post. January 2, 2009. This page was last edited on 12 September 2018, at 05:08 (UTC).